Progress is made through the game by fighting through Death Adder's henchmen, including men armed with clubs and maces, skeleton warriors, and knights. Players are able to attack using their weapon, jump and cast spells that hurt all enemies on the screen. The force of this magic depends on the number of "bars" of magic power currently available. The bars are filled by collecting blue 'magic potions' attained by kicking little sprites who then drop the potions. These sprites appear during regular levels and during bonus stages in between levels. The male warrior Ax is able to cast earth spells. The dwarf Gilius, casts lightning spells and the female warrior Tyris casts fire magic. Each character has a different number of maximum magic bars and varying ranges of attack. Various steeds known as bizarrians are found in the game. These can be ridden when the enemy rider is knocked off, or if one is found dormant. The least powerful steed is known as the Cockatrice, which can be used to knock down enemies with a swipe of its tail. The more powerful dragon, which can either shoot fireballs or breathe fire, is found later in the game. 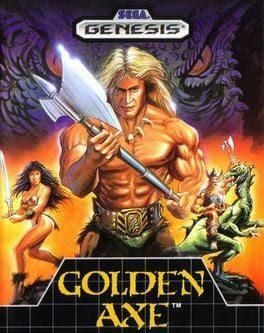 Golden Axe is available from 1.99 to 2.49 from 1 shops.